At least something got painted red. Nice wheel on the drive axle. Added by Thefireman on 24 March 2008.
were in my eyes a brilliant looking typical American fire engine. Added by Pete Matten on 24 March 2008. What would you call just the front without the Trailor attached? Added by JT on 16 April 2010. Added by Barrie Green on 17 April 2010. The "front" is the tractor. I don't think I've seen one detached from the trailer. Added by David L on 17 April 2010. I'll take that back. In one of the magazines I receive by the mail, I have seen photos of 2 tractors that were detached from their trailers. I don't have the photos, but I'll describe them. The first was rehabbed and an equipment trailer was attached for USAR, by a county fire department. 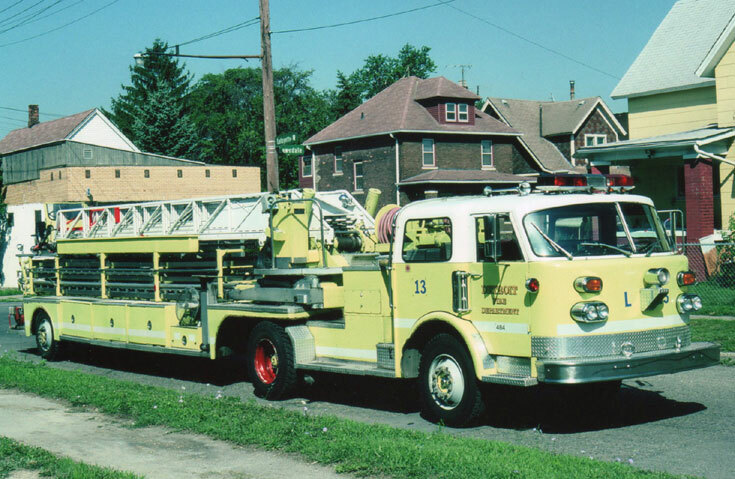 The second had its frame stretched, and had a 2000gpm (7600lpm @ 10bar) single stage pump mounted behind the cab. 2 1"-200' (25mm-61m) booster reels were mounted on top of the pump. It now tows an 8000gal (30,400l) water tank trailer behind it. It is used by a forest fire private contractor out in California, USA. Thanks for the Info. My dad has the tractor. No modifications made just totally redone with new interior, paint and chrome. Added by JT on 22 April 2010. OK JT,so I'm assuming this is no longer a fire truck(Tillered Trailor)but now your fathers got the Tractor,whats he going to do with it?. Added by Pete Matten on 22 April 2010.